By Cynical Mother | June 19, 2013 - 12:48 pm | SHE SAID WHAT? My son graduated yesterday. I cried. Actually, I was on the verge of sobbing. My lower lip was quivering, snot dripping from my nose and tears streaming down my face. Thank goodness another mother was cracking jokes or I would have made a complete fool of myself. Did I mention this was a kindergarten graduation ceremony? I couldn’t help it. It seems like just yesterday he was a chubby 10-month-old crawling on the floor. He is the middle child so I didn’t raise him in a bubble like my first born. With your first kid you boil everything. The second and third could eat dirt and you shrug it off. The five second rule becomes 10, 20 seconds or even a minute. Then, the teacher busted out the year review slideshow and I lost it again. I couldn’t believe how much my son has grown since the first day of school. He glanced over at me, rolled his eyes and said, “Oh, here we go. She is crying again.” Everybody laughed, myself included. He doesn’t get it. He won’t until he becomes a parent. I will cry on that day, too. By Cynical Mother | January 4, 2013 - 11:39 pm | SHE SAID WHAT? I just called my father to ask if he would watch my daughter while I picked up my 5-year-old son from school. I knew he would say yes, but offered a bribe anyway. “If you come over I will give you a body wash,” I said. “What?” he sounded confused. “I will give you a body wash,” I repeated in a sweeter voice. He seemed disgusted, “You will give me a what?” I have a closet of toiletries from extreme couponing. We won’t have to buy deodorant ever again. Need floss? I got you covered. Earlier today my father asked, “Do you have anymore of that soap you gave me? I really like it.” I was offering him Right Guard Total Defense Body Wash NOT to wash his body. “That soap stuff,” I stuttered. It dawned on me when I hung up the phone how disturbing my first offer must have sounded. I am sure that may be normal in some parts of West Virginia, but not here. I love my Dad, but I think I just threw up in my mouth. 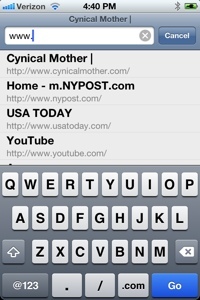 By Cynical Mother | December 10, 2012 - 3:56 pm | SHE SAID WHAT? I try to keep up with modern technology. My phone is smart. I regularly use hip text lingo. LOL. However, I just learned I am stuck in the 90’s when it comes to surfing the web. I didn’t get the memo that you no longer have to type “www” to access a website. My husband saw me logging on to the world wide web and asked, “What are you doing?” Nobody calls it the world wide web anymore? “You don’t have to type www,” he chuckled. I moved my pocketbook and sat down on the Davenport to catch my breath. Am I really that old? I did get a typewriter for Christmas once. I also remember the days of dial up Internet. It always seemed like someone would try to make a call when you were logging on. “Hang up the phone! I’m trying to get online!” I guess I just answered my question. By Cynical Mother | October 7, 2012 - 12:34 pm | SHE SAID WHAT? My children are going through withdrawal. I didn’t take away potato chips or candy. Their video game consoles are still intact. Geez, I am not a monster. I took away their grandparents. It had to be done. My mother has the flu. Of course, I am concerned about her well being. This woman gave birth to me. She is my best friend. However, I will admit the first thing that came to mind was “I hope the kids don’t get it.” I can take a cough. There is medicine to treat a fever. I can’t deal with three kids projectile vomiting. God created the vomit virus so the world wasn’t full of Duggar families. It’s birth control. I have become the person who hears a sneeze or cough and dives for cover like a soldier in combat. I was at the library last week and overheard a mother say, “Well, he has a cold.” I picked up my daughter and power walked out of there. Why the F*** are you at the library. Yes, there are probably more germs on the books than in a bowl of bar nuts. However, I don’t need your kid hacking on mine. Here is the thing about the library, they will let you borrow the books. I know, it is crazy! So, take your kid home and read. My children see my parents everyday. My Mom called tonight, “I miss my grandbabies.” It has only been 48 hours since we were last at their house. The truth is my kids miss them too, but right now it is every man for himself. Grandma will have to wait until she is healthy. By Cynical Mother | September 26, 2012 - 12:14 am | SHE SAID WHAT? My son’s homework assignment brought back a flood of memories. 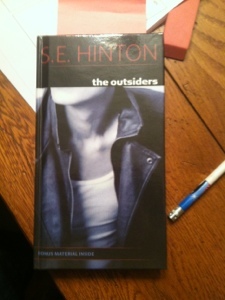 His class is reading the coming of age novel, “The Outsiders.” The assignment was to complete the first chapter and list descriptions of each character. I told him I had a poster of Ponyboy and Johnny on my wall when I was younger. I think I cut it out of Tiger Beat Magazine. Whatever happened to C. Thomas Howell anyway? I gave him the look, he smiled and finished reading.